Schedule changes that are forced by external events, like back to school, turning back the clock, or new evening activities, offer a terrific opportunity to intentionally add and subtract things from your existing routine. Since things are going to change anyway, why not add new habits and create a new routine that makes life easier and better? When we aren’t intentional, these transitional times can cause the organization in our home to blow up. As new daily responsibilities enter (making lunches, helping with homework, etc.) habits that were holding our home together often fall by the wayside. If your schedule is getting ready to change, either due to an external event or by your own choice, use it as an opportunity to intentionally change your current routine. Start by focusing on creating an evening routine that will set your morning (and the rest of your day) up for success. Consider what tasks and activities, if done the night before, will get your day off to a smooth start. Here are a few ideas. Pick out tomorrow’s outfit. When you decide what you’re going to wear the night before, it can save a lot of time, stress and drama in the morning. Encourage others in your family to do the same thing and if you have smaller children who need help, give their outfits some thought as well. Do this task early in your evening routine in case you have ironing or a quick load of laundry to do to round out tomorrow’s outfits. Pack it up. 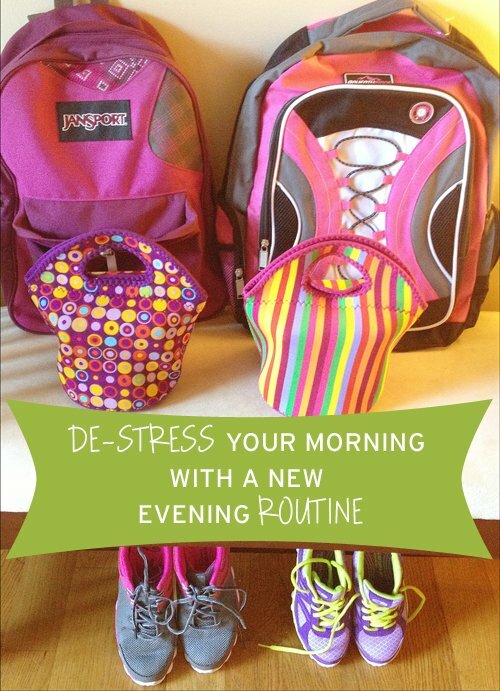 Pack lunches, your work bag, or anything else you might normally pack in the morning, the night before. This will save time in the morning, plus it will trigger you to take care of tasks such as filling out permission slips, checking homework, or packing your workout clothes. Tidy-up for 15 minutes. Nothing adds to the morning stress like clutter! Adding a 15-minute tidying session to your evening routine allows you to start the day with clear surfaces and a clear mind. Unplug and unwind. Turn off electronic devices at least 30 minutes before bedtime and put them on their chargers so they’re ready to go in the morning. Then, recharge your own batteries by doing something relaxing. Read a book, write in your journal, take a bubble bath, meditate or do a calming evening yoga routine. Taking steps to ensure a good night’s sleep is one of the very best ways to take the stress out of tomorrow. What do you do each night to simplify your morning? I’d love to hear your ideas in the comments. Thanks for sharing! I have a pouch in my pocketbook so when I plug in my cell phone I do that with the phone kind of hanging in the pouch. In the morning I just unplug & the phone goes all the way in the pouch so that I never forget it & leave it home. I tell my husband to sit his cell phone in the shoe of the pair that he is wearing the next day. I always kept the school lunch money in a container in the kitchen so the kids just took it out of there each morning. I had a list that I used when I worked outside the home. It was a little card I kept in my purse. It had what my morning routine was & what time it all got done. I was really quick at getting ready in the morning yet never rushed. I looked at this list before I walked out of the house. I never forgot anything because it was one my list. So I made sure I had my badge, breakfast food, comb, lunch money, etc. I had a long road to the hospital I worked at & their was not much traffic. So I would eat my yogurt, granola & fruit in a cup on my way. Many would say I should have been eating while driving but they would have to see how empty that road was. I also combed my hair on the way to work. The people I worked with took hours to get ready in the morning & I think I woke up at 6 a.m. showered, dressed, brushed teeth, grabed breakfast, etc & was out the door before 6:25 & at work early each day. I always had gas in the vehicle a head of time. I’m a list maker. I’m sure there’s a 12 step program out there for me. Every night I make a list of what I need in the morning before heading to work. Perfect example is tomorrow morning I have a furniture delivery coming then I’ll go into work but since I’m deviating from my normal routine, the list will make sure I don’t stray and forget something. The list will also include what I need to do while out at lunch or on the way home. This isn’t rocket science but sometimes my schedule is so routine that one thing can throw me off if it’s not on the list and I haven’t planned for it. It is amazing the difference when I actually get things ready the night before vs. the chaos when I don’t. Even better would be if I actually got up in advance of my kids to get showered, dressed and “make-up’d” – unfortunately, that rarely happens! This sounds so simple but I’m sure it makes all the difference. Tonight I’ll do the “tidy for 15 minutes,” and finish one project. I know I will love getting up to less clutter and one thing done in the morning. What a wonderful post! Being intentional gives us the opportunity to do our best. I like to put everything in the car the night before, except purse and phone that is. So if it is going with me tomorrow, it is in the car tonight. I love all the ideas. I’m going to try this year to get back on track. My son has ADHD every day is a challenge. He loves routine. BUT he can get out of that routine quick. Part of my evening routine includes setting up the coffee maker! I have been working on getting my 2 DS’s aged 9 & 13 to develop their own routines which include either making their lunch the night before or at least planning on what they are going to have based on what we have in the fridge and pantry. (A couple of years ago they complained once too often about the school lunches that I made them, so I gave them the job!) If there is something that they want, I have them add it to the shopping list on the fridge. One DS is pretty good at planning ahead and getting ready, but the other one… sigh, well let’s just say he’s a work in progress. Thanks for the reminder that the beginning of the school year is a great time to hit the reset button on routines; to tweak the old ones and create new ones based on new responsibilities. If I need to get something out of the fridge in the morning, I leave a memory prompt. For example, I might put a sticky note on the door to grab lunch from the fridge or I might put the silverware on top of the lunch box so I remember to grab yogurt and toss it into the lunch box. Getting up before my son is always useful, but I SO rarely do it! I keep my morning and evening routine in my Daytimer in a plastic sleeve and I check things off with a dry erase marker as I do it. I think I will post it to our white board though, as it doesn’t need to really come with me every where I go. The things on my evening list that are the biggest helpers are: to run the dishwasher, double check my calendar, and set out/ pack items I need the next day (BIG stresses if I don’t do that because our house is not totally organized yet and I will usually have no idea where something is! It’s getting better though… babysteps! I always grab the laundry from my kids’ laundry baskets when I say goodnight to them. Then I bring them to the laundry room, sort them, and start a load. In the morning, when I get up, I put it in the dryer. Then I fold the laundry before I get my daughter off to high school. The load is usually not that big, so it does not take long. I find that if I do a load a day, it does not pile up. Wow, those are some impressive examples. DH bought a programmable tea maker a while ago so that’s now part of our evening routine. It’s nice to wake up to a fresh pot of tea. For me it all depends on my shift. When I’m on an early shift I pack breakfast and lunch the night before. Big timesaver! During a series of late shifts I only ‘reset’ the livingroom and kitchen and just make breakfast etc. in the morning. I am a list maker also and have both paper and electronic lists. I use a phone app for my electronic lists and 2 magnatic whiteboards on our fridge, 1 is for family messages and the other for my first remember/to do list. I always check the fridge lists before bed and when i wake up and the elctronic are great when i am not at home and i can sync it with my family so we have joint shopping lists or to do lists and i can set a reminder for them. So now the 15 minute clean up at night will now be added to my routine to make the mornings easier. Thanks for the tips.